Academics are required to not only find effective ways to communicate their research, but also to increasingly measure and quantify its quality, impact and reach. 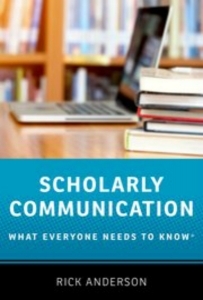 In Scholarly Communication: What Everyone Needs to Know, Rick Anderson puts us in the picture. 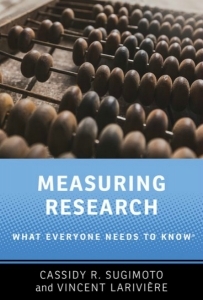 And in Measuring Research: What Everyone Needs to Know, Cassidy Sugimoto and Vincent Lariviere critically assess over 20 tools currently available for evaluating the quality of research. This post originally appeared on LSE Review of Books. If you would like to contribute to the series, please contact the managing editor of LSE Review of Books, Dr Rosemary Deller, at lsereviewofbooks@lse.ac.uk. Scholarly Communication and Measuring Research are both new A5-sized books in the Oxford University Press wide-ranging series What Everyone Needs to Know, which will eventually contain some 200 volumes from A (Attention Deficit Hyperactivity Disorder) at one end to Z (ZIKA virus) at the other. Both of these texts under review clearly master the brief communicated by their titles, and both have useful indexes and suggestions for further reading. Scholarly Communication is the more substantial of the two, with 280 pages compared to 150 in Measuring Research. Rick Anderson, the author of Scholarly Communication, may not be widely familiar in the UK, but he is well-known in the United States as an award-winning librarian with over 25 years’ experience in the field, and as a regular contributor to The Scholarly Kitchen, a blog established by the US Society for Scholarly Publishing. Scholarly Publication contains fourteen chapters, beginning with definitions and history and ending with some thoughts on the future of scholarly publishing. In between there are chapters asking: who are the scholars and why do they communicate? What does the scholarly communication marketplace look like? And what are the roles of university presses, libraries and copyright? There are also chapters on metrics and altmetrics, metadata and on other problems and controversies in scholarly publication (such as open access and predatory publishing). Each of the fourteen chapters is divided into numbered subsections with subheadings posed in the form of questions, thus engaging the reader. Also, perhaps inadvertently, there are useful summaries of American practices which will benefit non-US-based readers. In particular, I found a section outlining differences between various US educational establishments helpful. Anderson aims in each chapter to discuss relevant issues of concern rather than advocate a particular stance, thus allowing readers to form their own opinions. Sometimes, of course, in such a succinct text, some issues get overlooked or only briefly mentioned. In his section on identifying predatory publishers, for instance, Anderson does not note that they almost always fail to mention at this initial stage the advance processing charges (APCs) that will come later. Perhaps more surprising, Anderson does not comment on the 2012 San Francisco Declaration on Research Assessment (DORA) that recommended that journal impact factors should notbe used to assess the quality of individual research papers or researchers. It is a pity too, that despite a lengthy and useful chapter on the challenges and opportunities of open access, this text was completed before Plan S emerged – a major proposal about the future of open access publishing and who is going to pay for it. This proposal has massive implications for scholarly publishing for academics as a whole, and particularly for scholars in the Global South, as well as for independent researchers. Cassidy Sugimoto and Vincent Lariviere are well-known writers in the field of academic writing and publishing. As noted above, Measuring Research is much shorter than Anderson’s text with only four chapters covering ‘The Basics’, ‘The Data’, ‘The Indicators’ and ‘The Big Picture’. As in Anderson’s Scholarly Communication, each chapter is usefully divided into subsections with headings written in the form of questions. ‘The Basics’ introduces the book’s subject matter and the historical foundations for measuring research. ‘The Data’ explains what a citation index is and what it does, comparing The Web of Science, Scopus and Google Scholar. And, in what must be a tour de force in the field, ‘The Indicators’ contains over twenty separate subsections, each discussing a different research measure. Some of these simply count text features, such as the number of authors, references, citations and self-citations. 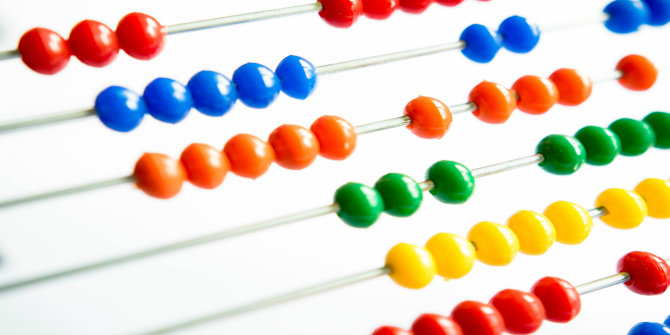 Others involve more calculations, such as the now somewhat derided ‘journal impact factor’ and the h-index (an author has an index of h when they have published h papers, each of which has been published at least h times). Other measures included are various alternative or ‘altmetrics’ – measures that supplement citation measures, like Twitter counts, Eigen factor scores, CiteScore and others that are much more complex than these. The final chapter, ‘The Big Picture’, examines who controls research measurement, the adverse effects of such quantification and possible future developments. An interesting observation made here, for example, is that although some Chinese universities rewarded their academics financially for submitting papers to high impact journals, leading to an increase in submissions, there was not a corresponding increase in acceptance rates. The issues discussed in this last chapter suggest to me that our current obsession in the UK with the next Research Assessment Exercise (RAE) is likely to lead to severe restrictions in the range of research supported and rewarded. Both Scholarly Communication and Measuring Research fit well together in this series of What Everyone Needs to Know, and each should occupy a welcome space on researchers’ shelves. Though, perhaps somewhat surprisingly, neither text has much to say about academic writing, and the various tools that we might use to measure and improve it. James Hartley is emeritus professor of psychology at the University of Keele. He is the author of Academic Writing and Publishing: A Practical Handbook (Routledge, 2008) – and has an h index of 47.